I worked on a new release of the Plone addon for the current LibreOffice templates website. It will contain a new module for small template projects, which make it fast and easy to create and submit a new templates project and publish a LibreOffice template. I’m going to release this release during the next days. It will need the support of a member of the Document Foundation admin team to provide the improvements to the user of the website. I worked on some further improvements of the Plone addon that drives the current LibreOffice extensions website. I could especially improve the search feature and the listing of the extension projects. I published a new release of the addon with the improvements on the ‘Cheeseshop’ today (release 0.29). I finished my work on the implementation of a new module and new features for the Plone addon that drives the current LibreOffice extensions website. 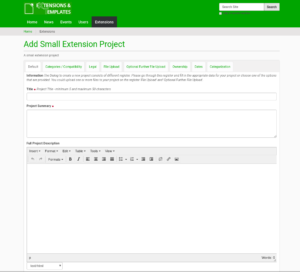 The addon contains the new module for small extension projects which makes it easy and fast to submit a new LibreOffice extension. The release is published in the ‘Cheeseshop’ (https://pypi.org) at: https://pypi.org/project/tdf.extensionuploadcenter/. It is release 0.28 of the Plone addon. I worked a bit with one of the Plone addons for the LibreOffice extensions and templates website and added a new module to submit easy and fast a new LibreOffice Extension. The module consists of only one edit dialog. It is structured in register and got already a view. The edit dialog as well as the project view are configurable. It’s not that big deal to make any changes on the view, if you have some knowledge on web technology. Plone Only For Large Scale And For Big Company? I read in the minutes from a board meeting of The Document Foundation (TDF) the belief ‘plone is a CMS for large scale & for a big company etc.’ and ‘there perhaps suitable’. This seemed to be a lonesome view from the leading body of this entity and not generally shared. Thus the view of the TDF board proofs wrong. The organizations and companies which launched and use Plone site benefit from the excellent stability of this Content Management System (CMS) (information about Plone security could be found at: https://plone.org/security).